Lights along the 71 Highway corridor were being replaced by the Missouri Department of Transportation on Wednesday because thieves are stealing copper wiring in the lights. KANSAS CITY, Mo. -- Lights along the 71 Highway corridor were being replaced by the Missouri Department of Transportation on Wednesday because thieves are stealing copper wiring in the lights. Officials say this is the worst they've seen in years. "We're getting a lot of phone calls and trying to find a way to get the lights back on," said Susan Barry, MoDOT's assistant district engineer. Barry says the thieves steal thw copper wiring by getting into a controller station and cutting the copper and pulling it out, causing the whole corridor to be affected. "That shuts off a pretty long series of lights," said Barry. "They are all connected so you get a pretty long stretch in each circuit so it shuts off the entire circuit." That affects all of an 11-mile stretch of 71 Highway. The stretch includes more than 900 street lights. In 2016 and 2017, MoDOT spent about $850,000 on light repairs. So far in 2018, the department has already spent that same amount with more than two months remaining. 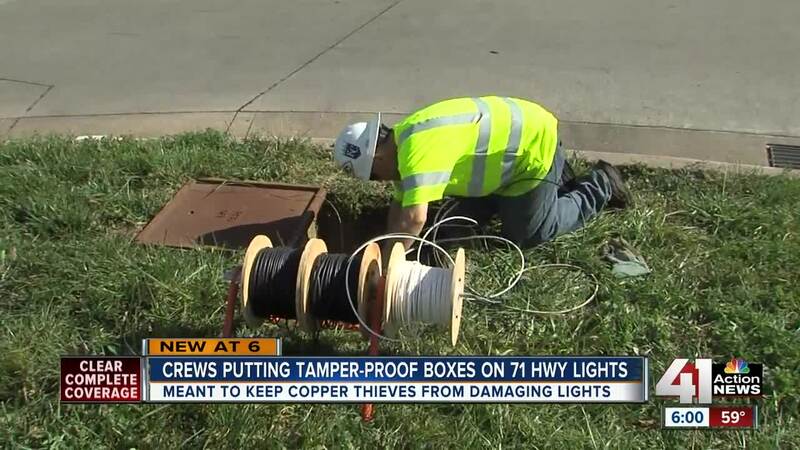 To prevent future thefts, MoDOT is now installing a tamper-proof plate on the lights, making it more difficult for thieves to steal the copper wiring. Also difficult: tracking down the vandals. Traffic cameras only broadcast live traffic, so investigators can't use recordings to catch the thieves. Anyone spotting the thieves in action should call police.